If you are planning a private party, corporate event, drinks reception, product and film launch, cocktail party, birthday party, formal dinner dance, seminar, presentation or a meeting, conference, Christmas party, client entertainment, summer ball or any other type of event production, we are here to help. We have links with top restaurants, prestigious hotels, exclusive members bars, trendy clubs, private screening rooms, corporate venues, private boats, yachts and unique venues in London - all available for private and exclusive hire. 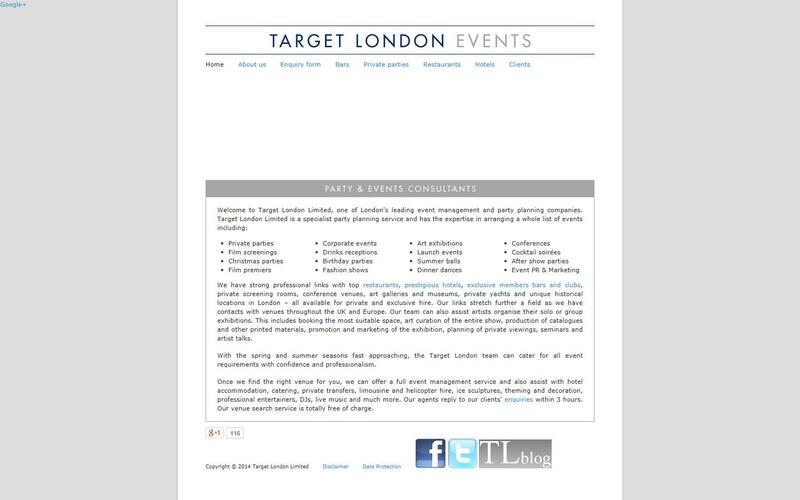 Target London Limited also deal with venues that have amazing views over London suitable for photographing and filming. I was worried about organizing a function at our area but these people helped me a lot. They have arranged everything to make the function a successful one. 100% recommended.